No one will be surprised to read my review of this jacket. Everyone was expecting and anticipating perfection with this and I'm thrilled to say that (as their reputation would dictate) Magnoli certainly delivered! The suede is surprisingly soft, I'd expected a slightly rougher texture but the jacket is incredibly luxurious. 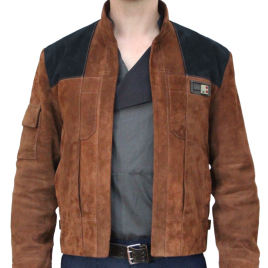 The fit is slim and cropped (providing your measurements are accurate) and certainly helps to lend you that heroic shape seen on Alden Ehrenreich in the movie. Magnoli's quality has always been highly praised and this is certainly no exception - I've never ordered such a high-profile item from them and was nervous about inputting my measurements, paying the full amount, and then waiting for delivery seeing as I was on the pre-order - but I'm so thrilled I did. In pretty much every detail, and from every angle, this jacket feels like it was fulled straight off of Han's back and put into my hands. I can't express enough how happy I am with mine, the first thing I did after a quick test fit was put on my entire Solo costume and take some photos. It's truly a work of art. Don't hesitate to order one of these, they work well for your costume or just for casual wear!